When it comes to fringe theatres, there are so many more to be found North of the river Thames than South of it. As a South East Londoner, going to the Brockley Jack Theatre and witnessing a lovely piece of theatre is even more enjoyable as it’s in my neighbourhood. This week, Howard Coyler’s adaptation of Franz Kafka’s most famous novel, The Trial, was staged. I had seen The Trial on stage twice before, but this was particular as it was a monologue, performed by Brendan O’Rourke. The story is that of Joseph K., who on the morning of his 30th birthday, is arrested for no apparent reason. In this production, we meet Joseph K. in his prison cell, one year after his arrest. He takes us through how his confusing, nightmarish and incomprehensible arrest went and how clueless he remained throughout the odd events and encounters. This idea of being arrested and not knowing why can touch readers and audience members in many different ways, I imagine. I connected it with a feeling of guilt that I may not know the reason for. This can be a very vulnerable and personal situation and can make you feel alone. And this is what we see with Joseph K.: a man who may be talking to people, and is trying to count on the law to back him up, but who is always alone. The Trial was written at the beginning of the first world war, a time when Franz Kafka was “a minority of a minority”: not only did he speak German in a city where it was not widely spoken, but he was Jewish. Some Jews were apparently being accused of crimes and standing trial in Prague, even if they were not guilty. The similarities between Kafka and his character can’t really be ignored, can they? 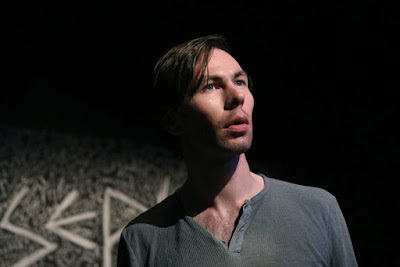 Brendan O’Rourke and Saul Reid’s set design show the floor of Joseph K.’s prison cell with its surrounding floors and walls covered in words written in chalk. If one looks closer, Joseph K. is written everywhere, in big and small writing. I can imagine one of the thoughts behind it was to show a man who was obsessed with remembering who he was, with staying true to himself in the midst of the incomprehension. If the law, that one human right, can’t protect him, surely the memory of himself will? O’Rourke gave a strong performance as Joseph K., bringing an animalistic quality to the role, especially when playing some of the characters Joseph runs into on his journey to his arrest. His ability to change his accents, voice and even breathing pattern drew me in. Director Saul Reid also sometimes oriented him away from the audience, giving him privacy but also implying eyes looking at him from every side. Directing a monologue must be quite a challenge, and here Reid gave a lot of variety and changes in pace to the text. Having been given the play text, I can see that Howard Coyler started a new line every few words, which gives the director and actor a new dimension in terms of speed and importance of words. When I think of this idea of the Trial in today’s world, I think about certain people coming to Europe from difficult and war-torn regions, and who are “tried” or “judged” on one trait – the fact that they are migrating. Joseph K. is constantly being called “guilty”. His other traits become unimportant. It is the same with the individuals who travel thousands of miles for safety – they are more than one thing but face the danger of being only that one thing in the eyes of others. The Trial was for me a powerful production carried by strong acting and which proved that this novel can keep being taken in multiple directions.